May 2013. Join us. The maximum distance in one hour on $1.00 of the energy of your choice wins. University race teams, enthusiasts, Formula SAE and Formula Hybrid teams, hobbyists, inventors, and OEM race teams are welcome to compare their performance on the same track on the same day, May 2013. Entry Fee $150.00 per vehicle. Please sign up at Smitty and the Professor. 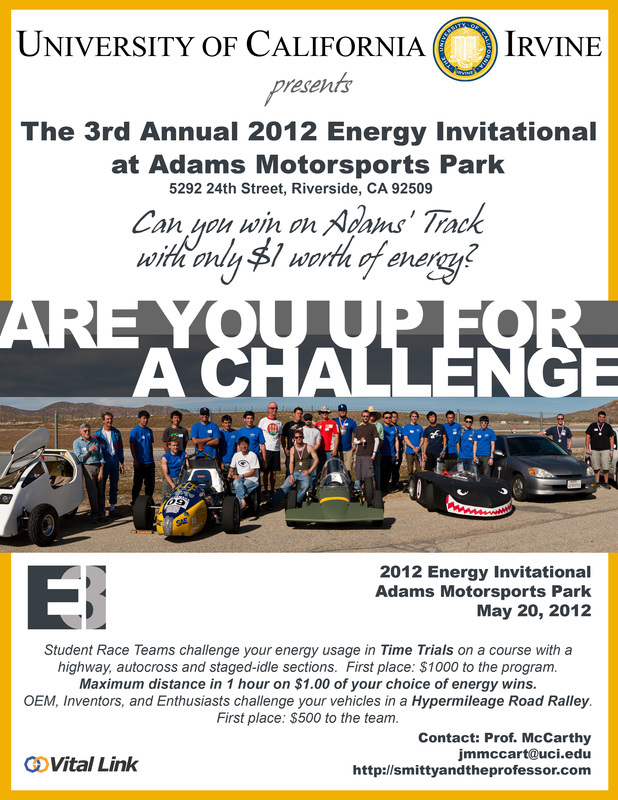 Join us on Sunday, May 20, 2012 at Adams Motorsports Park, Riverside! Student race teams compete for maximum distance in one hour, on $1.00 worth of the energy of your choice. OEM and enthusiast race teams compete in a Hypermileage Rally. Compare their performance on the same track on the same day. Entry Fee $150.00 per vehicle.